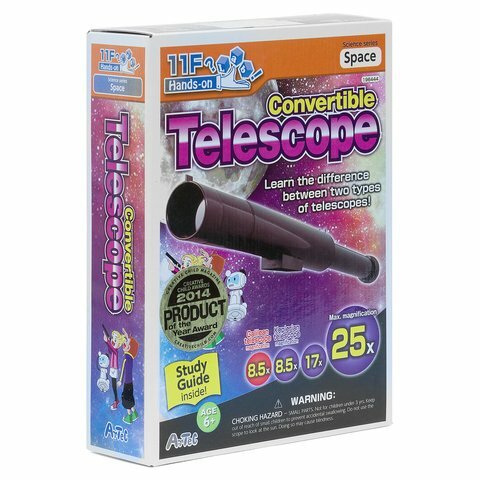 Artec Convertible Telescope is a kit for individual assembly of a telescope with 25x magnifying power that converts between two types: a Galilean and Keplerian telescope by simply changing out lenses. Follow the illustrated and interactive study guide to first learn about convex and concave lenses, then assemble the telescope and learn how to use it. The full-color illustrated study guide is easy-to-follow and very informative. This kit and study guide are perfect for classroom lessons and for an educational afternoon activity. Follow the illustrated and interactive study guide to first learn about convex and concave lenses, then assemble the telescope and learn how to use it. Learn about convex and concave lenses. Build telescope that converts between Galilean and Keplerian ones. Convex lens — 1 pc. Concave lens — 1 pc.